Although I consider myself to be very responsible, I am always looking for ways to be better organized. While the thought of a planner excites me, I buy one every year and then I am not that great about using it. 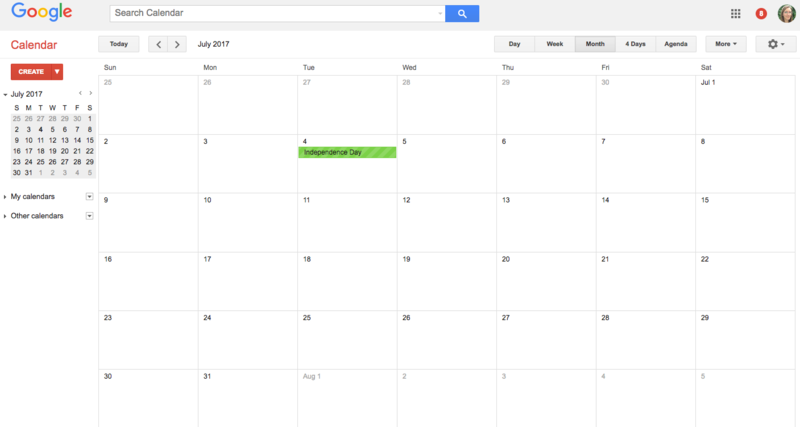 At one point, my husband suggested I try Google Calendar and that we create a shared calendar. This has been hands down AWESOME. So here are the ways I use and love my Google calendar! I can share things on the family calendar, or put on my own personal calendar. For one, I put EVERYTHING on the calendar. 99% of these things are put on our shared calendar, and that way we can always see what is going on. There are two options for stuff you don’t want or need to put on a shared calendar. One is to put the event under your name, and the other is to have a separate calendar (or calendars). Maybe you are planning a surprise birthday party for your husband? That goes on your own calendar. Or if I have blog or personal deadlines, I can keep those on my own calendar and not clutter up my husband’s calendar with that. The shared calendar is so great – we can easily see what is going on for both of us. The kids always have something going on, so it is great to be able to check the calendar and know where everyone is. If we need to check our availability on a certain date or time, it is nice to be able to glance at the calendar and know right away if we are busy or not. My tip: put things on the calendar as soon as you know about them! There are so many options for each entry. The calendar entries really take any info you need to put. Obviously, date and time. You can also do blocks of time (for example, spring break). Then you can put in a location, which syncs with Google Maps if needed. You can personalize colors, notifications, etc. There is also a field for any other info, which is great. There are times the kids have events and I copy in all the info so that it is there when I need – or if my husband ends up taking the kids to that event, he has the info. Set alerts so you don’t miss things. You can set different alerts for each entry. Sometimes I want a notification to pop up that morning, or 10 minutes before the event. This way, you don’t have to worry about forgetting things. This goes for everything from a dentist appointment to birthdays. The Google calendar syncs with my iPhone, so I can check my phone any time to see what I have scheduled. So in lieu of a paper planner, I always have my iPhone on me, and therefor always have access to my calendar. This is great for when I am at work coming up with my work schedule, or when I’m trying to schedule something on the fly – countless times! 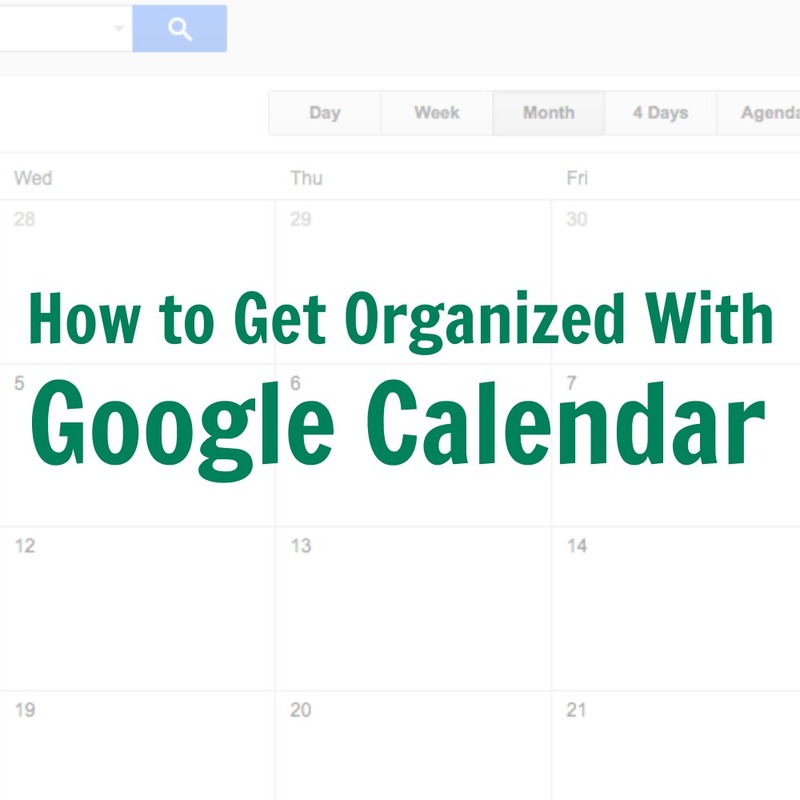 Google Calendar has helped me get more organized and also for us to be more organized as a family. I use numerous features and it makes my life a lot easier! We just started using Google Calendar at work, but they really did not teach it to us. I need all the info that I can get. This is so nice, I use many Google features all the time, but wasn’t aware of this, I must check it out asap! I have never used google calendar before. Sounds great. I will have to check it out. I have not used Google calendar, and I do not know why I have not used it. I need to check it out and use it for my appointments! I never knew Google had a calendar! Will be checking this out. Thanks! I love, love, LOVE! Google Calendar, I think I couldn’t live without it. Is the first thing I check in the morning and the last thing I check before I go to sleep. I love my planner. I write everything down there, HOWEVER, I tend to leave it on my desk when I’m at meetings or on the go. Google calendar is my lifesaver. Anything that goes in my planner goes on my Google calendar. I’d be lost without it! I use google Cals as well. My hubby can see my personal cal but I don’t think it’s exactly a shared cal. I’ll have to look in to that one.